Safety experts recommend a deadbolt lock on all home exterior doors as a primary means of keeping your family safe. If the lock is installed properly, and is of sufficient quality, it hampers and delays someone coming into your home uninvited. 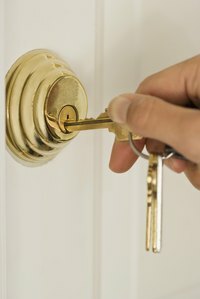 During the winter, though, a deadbolt lock can suffer from the same sluggishness in action that many exterior locks do. A deadbolt lock is not a complex machine, but it depends upon multiple moving parts to do their job. The indentations in the key push inside tumblers into the correct position, freeing the bar that keeps the bolt from recessing into the lock. The turning of the key then pulls the bolt back or locks it into the door frame, depending upon the direction of the turn. Dirt, dust, other debris and oil from fingers are the reasons a tumbler lock becomes harder to move when it is cold. The oil from fingers transfers to keys, then transfers to the lock interior. There, it mixes with the material that seeps in through the keyhole over time and becomes a sticky mass. During warm weather the force of turning the key can overcome the mess inside, but cold weather allows it to congeal into a hard substance the same as grease does on the stove top. A simple solution is to squirt a commercial lock lubricant into the keyhole. This could provide sufficient lubrication to allow the tumblers to slide past the obstacle. A better solution is to take the lock apart, clean it and provide the lubricant directly to the interior. Most deadbolt locks require only a screwdriver to take apart, and it is easy to do. Having a digital camera document the steps as you perform them allows you to remember how to put it back together. The ring on the inside case pops off by inserting a screwdriver under it, or it might have a small screw holding it on. Remove the case and there will be two long screws that connect the inner lock with the outer lock. Have someone hold the outer lock while you remove the screws. The two sides pull apart with just a tug. Clean the inner parts with a cotton swab and isopropyl alcohol until they are free of debris. Squirt lock lubricant on the interior parts, test it with a key to make sure it is working, put it back into the door and screw it together.